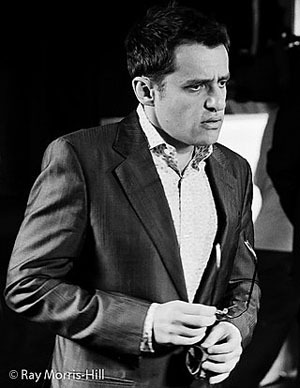 Will Levon Aronian make a move? Preview: After the second rest day we resume play and will see if the spirited play continues. There are some marquee matchups including Carlsen-Radjabov. In fact, all of the games feature pairings players who are close in age and are contemporaries so familiarity will be a factor. Kramnik-Gelfand (48 encounters), Aronian-Grischuk (22 encounters including 1997 when they were both about 15), Ivanchuk-Svidler (32 encounters) and Carlsen-Radjabov (23 encounters). The games will prove to be contentious as there is an interesting contrast of styles. It is certain that players realize that this may be the best chance to capture the world title as Viswanathan Anand is in the sunset of his career. The fighting chess is inspiring and most certainly the World Champion is paying close attention. 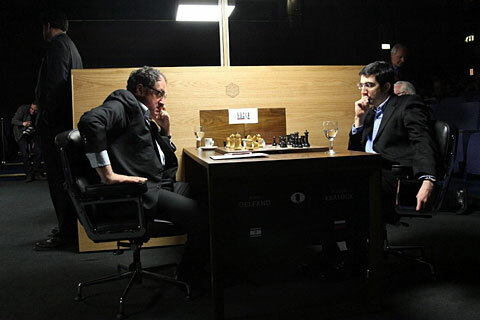 Boris Gelfand missed a great opportunity against Vladimir Kramnik. Boris Gelfand may have missed his chance after missing 19.Nfg5! h6 20.Qh5 with a winning attack. Ironically, he analyzed the also-strong 19.Neg5!? h6 20.Bg6! He didn’t play that either, but instead the passive 19.Ned2? The commentators stated that this may be due to a lack of confidence in his current form. Overview: While there is a giant ferris wheel in London, this round was more like a roller coaster with three of the games being on the brink of a decisive result. Ivanchuk-Svidler didn’t provide a rich discussion, but Gelfand-Kramnik was stirring when the Israeli had a chance to play the strong 19.Nfg5! with a winning attack. After 19…h6 20.Qh5 hxg5 21.Nxg5 Nf6 22.Qxf7+ Kh8 23.Nxe6. The commentary box had gone through this during the game and felt sure Gelfand would play it. Neither player saw it and only looked at 19.Neg5 h6 20.Bg6! This was actually winning as well, but Gelfand played the passive 19.Ned2 and the game fizzled into equilibrium. Aronian-Grischuk had a moment when the Armenia had a strong hand after sacrificing a pawn. Unfortunately he was unable to muster up more than a slight edge in the ending and the drama ceased after 43.Bb6. The big match of the day was Carlsen-Radjabov with two contemporaries battling. Magnus Carlsen escaped once again after Teimour Radjabov played the winning 22…Ng2! Carlsen was visibly upset despite holding the draw. Carlsen opted for the solid anti-Sicilian, but chose a rather strange setup. 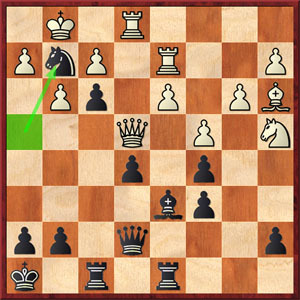 With the queenside locked, Radjabov took advantage of white’s offside pieces and launched an impressive attack initiated by 19…Bxf3! 20.Qxf3 Nh4! After 21.Qe4 f3 22.g3 Ng2! black had a winning attack. 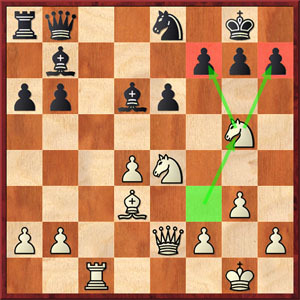 Carlsen had to donate the exchange to avoid a virulent attack with …Qe6, …Qh3 ideas. After 23.Nc3 Qe6 Re3 Nxe3 25.fxe3 black was a clear exchange up, but something strange happened. In trying to find a win, Radjabov fell low on time and played 25…f2+? (25…Rf7) 26.Rxf2 Rxf2 27.Kxf2 Rf8+ 28.Ke2 Qh3 29.Qh1 and white was holding. Carlsen was flustered in the post-mortem and did not seem willing to discuss such a position. Radjabov was grasping for a reason that he allowed a save, but he certainly came close. Carlsen’s poor composure during the press conference caused quite a bit of a stir. Tomorrow is a new day… seven rounds left.